About: The Three Kings serve traditional European and vegetarian dishes and can cater for private parties of up to 120 people. They show Sky Sports on televisions and also have a disco where DJs play the latest tunes. In the summer clients can take their drinks to the park opposite. The Three Kings in Clerkenwell is the owner of yet another vinyl jukebox that does its best to play along with the welcome alternative vibe in this Clerkenwell pub. Expect reggae, roots and rock for your coinage. In a toss up between the Three Kings and The Jerusalem Tavern for our favourite Clerkenwell pub with an open fire, The Three Kings came out on top. Why? Because the less busy, infinitely more soulful pub is a more open fire kind of a place. While the Jerusalem Tavern has the ales and the attractive architecture, The Three Kings has a plastic rhino and a vinyl jukebox to bed down with. And that is us all over. "The Three Kings is an excellent find"
Tucked away on a quiet street in the heart of Clerkenwell, The Three Kings is an excellent find. Hidden in the shadows of St James’ church, the pub attracts a broad following of regulars, local workers and wanderers who have stumbled on the twisted traditionalism of its decor. The ambience is all about a heart-warming of community and the pubs aesthetic individualism extends to the array of friendly characters you’ll generally find. The bar staff chats to all, as do the regulars and you’d guess that it wouldn’t take too many visits before everyone knew your name. The interior is a small space filled with classic touches of stripped wood and brass rails alongside disco balls, full wall collages and the odd rhino head mounted to the wall. Seating is limited to the lucky few who arrive early of an evening but it’s more of a standing place anyway – especially during summer when the streets are littered with drinkers. There is further space upstairs in separate rooms and you might be persuaded to stay a while thanks to the excellent vinyl jukebox. The strong musical theme stems from their towards a scattergun approach to hosting live bands (with a strong folk presence) and a famously difficult music quiz. The draught beers are well kept and inclusive of Red Stripe, Timothy Taylor and a good few rotating ales, which makes this a true destination for those who like the quirks of a pub to be matched by the line-up on the taps. 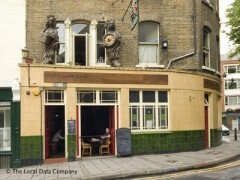 Without a doubt this is one of the best pubs in Clerkenwell.